From the best snowboarding accessory company on the market comes the ultimate snowboarding accessory kit. 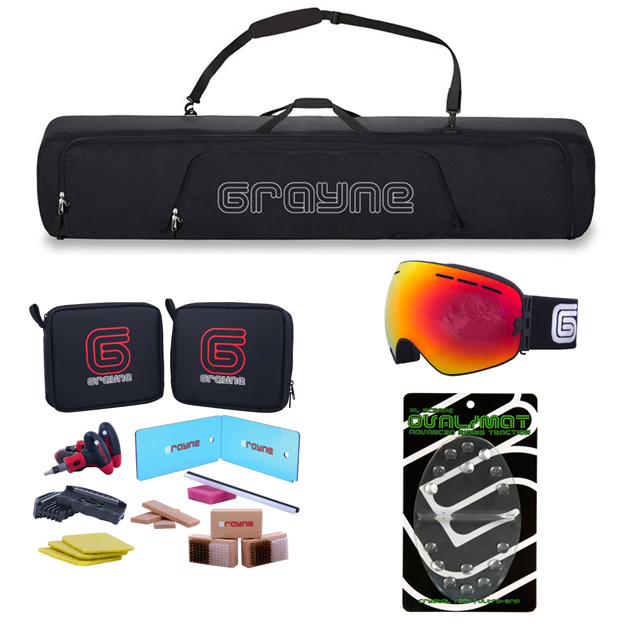 This complete kit starts with Grayne’s Pro Deluxe Padded snowboard bag, a bag that features super dense padding and a ballistic nylon exterior! This bag fits all your snowboarding gear including tools, goggles and more. Then there’s the Grayne tuning and wax kit. With everything you need to keep your board is pristine shape and repair previous damage, this is a must have for every snowboarder. From P-tex for base gouges, an edge sharpener, and everything you need to wax your board except the iron, you’ll never have to take your board to a shop again! Grayne then adds in one of their premium stomp pads to help keep you glued to the board when getting off lifts. Never slip and fall again! Finally, to round out the kit, Grayne includes your choice of any of their goggles! Featuring the best anti-fog and anti- scratch technology on the market these goggles are unreal. Add in their super easy lens change and minimal frame designs, you get the best field of vision available! The Grayne Pro Deluxe bag is redefining board protection. A sturdy, high density foam is packed in to each of the walls and in to the bottom of the bag to provide maximum care for your gear. The exterior of the Pro bag is made of a heavy duty, double stitched ballistic nylon, leaving it practically bombproof. Inside the Pro Deluxe bag you will find a large compartment with tons of storage room. With sizing that will fit multiple boards up to 170 cm, you’ll still have plenty of room for a pair of boots, a set of bindings, and maybe even your jacket and pants! For even more storage the Pro bag features two additional accessory pockets. Grayne Complete Ski and Snowboard Tuning Kit : The ultimate tuning kit for all your snowboards and skis. Starting with a complete waxing setup, you get a brick of lightning fast all temp wax, large ultra-durable scraper, and a brass and nylon bristled brush, you can easily wax your board at home or on the go! Need some extra grip on icy or hardpack days? Make your edges razor sharp with the Dual Degree Edge Tool which gives you an 88 or 90 degree edge in seconds, simply pick your degree and slide down your edges! Got a screw or binding part coming loose? The 6 piece ratcheting screwdriver can tighten or take out any and every screw on your binding, featuring 5 different bits and 8 and 10mm wrench! Add in two P-Tex candles for filling gouges and core shots, a deburring and polishing stone for removing rust and burrs from your edge as well as quick detunes, and a nylon base pad and you have a full tuning shop at your disposal. Stay glued to your board with only one foot strapped in! Made with the highest grade adhesives that are specifically designed to function in snowboarding conditions, this stomp will stay firmly in place on your board and keep you in control while getting off lifts or even when boosting huge one footed airs! Also featuring a scraper in the center of the mat, days of snow caked to the bottom of your boots are gone. Grayne’s all new Canyon goggle is raising the bar when it comes to fog free riding and high end performance! With the most minimal frame possible, the Canyon has a huge field of view and maximizes your peripheral vision. A super quick and easy lens change, simply flip the levers on each side of the lens and lift it out!. A spherical, dual lens, sealed with Grayne’s superior moisture-lock technology enhances vision and is the start of what makes the Canyon the most fog resistant goggle available.